What is the Holy Quran? The Holy Quran is a compilation of the verbal revelations given to the Holy Prophet Muhammad (saw) over a period of twenty three years. The Holy Quran is the Holy Book or the Scriptures of the Muslims. It lays down for them the law and commandments, codes for their social and moral behaviour, and contains a comprehensive religious philosophy. The language of the Quran is Arabic. The Holy Quran is divided into 114 Surahs or Chapters and each Chapter consists of individual Ayaat or verses. 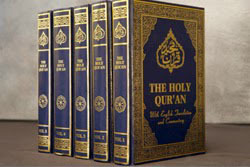 There are in total 6,348 verses in the Holy Quran. The Surahs are of varying lengths, some consisting of a few lines while others run for many pages. Surah al Baqarah (Ch.2 ) is the longest Chapter comprising 287 verses while Surah al Kauthar( Ch. 108) is the shortest with only four verses including the tasmia. Copyright 2018 Ahmadiyya Muslim Mission Singapore. All Rights Reserved.